A version of this article was originally published as my editorial for Cloud961 Magazine's April issue. It seems that everyone is sticking their noses in the bloggers’ business these days, with no regards to their feelings—as if they are not living breathing human beings, but rather products that they can exploit or manipulate as they see fit. (If you cannot pick up on OR do not master the art of sarcasm, I suggest that you do not go through reading). First, there are the agencies who proudly announce to their clients that they are so close to the blogging community in Lebanon that they practically “own” them. They brainwash their clients into believing that they can push any content they want publicized to these bloggers and those would gladly oblige because they “crave content” and they would “do anything to please the agency” or get the opportunity to test the latest smartphone model or car. Second, there are those washed-up-advertisers-turned-bloggers who try to impose rules on other bloggers for the purpose of driving more traffic to their blogs and come across as authoritarian and influential to their clients. They make demands—like full disclosure of a blogger’s agreements with brands—to their readers, something they are not entitled to ask for because it is none of their damn business. Bloggers are known to receive products from brands to test and review or invitations to VIP events, among other freebies. It is then up to the blogger’s own judgment to accept or reject the terms of such agreements, and it is up to them to decide which parts of the agreement to reveal..
Take if from a traditional marketing point of view: when a campaign is held on television (such as a TV commercial, a giveaway or a competition), is the public entitled to know how much the brand or its agency paid the TV station? Are they entitled to poke around the station’s business and demand the latter reveal the full details of the agreement between the advertiser and the station? Third, there are those brands or companies that think they can do whatever they want without any consequences. If a blogger or a journalist tries to expose their deceits, they threaten them with lawsuits or Cyber Security Bureau investigations, without even having a solid case. They use their connections in the government to intimidate bloggers and stress them out until they meet their demands. Take the Rita Kamel v. Web Awards case as an example. The Pan Arab Web Awards Academy is a private company that is engaging in public deception. They are selling their awards to anyone who would buy them and then convincing the public that these awards were well earned (with no credible criteria of winning, like a panel of judges or public voting). Public deception is a crime that is highly punishable by the Lebanese law. On the other hand, blogger Rita Kamel, exposes this scam after receiving an email asking her to pay for her award or it will be given to someone else. Obviously, the owners of the Web Awards did not approve of Kamel’s criticism and used their connections to summon her for investigation while toying with her continuously about a lawsuit without any official court subpoena in over a year. Kamel, who is not a legal expert, does not know that Web Awards Academy does not have a strong case. This is partly because the Lebanese print law does not apply to online publications, and partly because Kamel can easily file a countersuit on the grounds of a baseless trial and public deception. She has been worried and stressed out for almost a year, which can potentially affect her life and health. Where am I going with this, you ask? 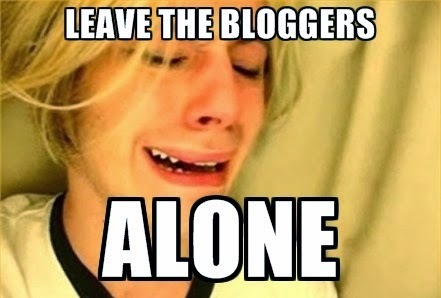 I want to make it clear for everyone that bloggers are not at their disposal to manipulate whenever they need to. They are not a product they can sell to their clients. Bloggers have their own freedom and integrity and they will fight back against anyone who tries to rob them from their rights. I ask the bloggers in Lebanon once again to unite and put all their differences and jealousies aside, especially when it comes to battling injustice and unfairness. As I have said on several occasions, they should establish an official union or syndicate with lawyers and legal support to defend their rights and form a sustainable ecosystem for them to flourish in. Cloud961 is the bloggers’ magazine before anyone else’s, and our team is prepared to assist in any case where bloggers are not treated right. Do not hesitate to drop us a line if you feel that any of your rights as a blogger are being violated.